It would be kind of nice to be one of those people that's all, "I hate fried foods, they are so greasy and disgusting. I LOVE brussel sprouts and broccoli though! Seriously!" The truth is, while I really *do* like healthy foods, I also love junk food. A lot. I'll just be real with you: my heaven consists of a place where I can constantly eat macaroni and cheese, fried chicken, nachos, french fries, brownies, fettucine alfredo, and red velvet cake while also being totally healthy and fit. However... we're in the real world, and that's just not gonna fly. 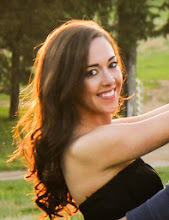 SO, I try to combine my love of food with my love of living a healthy lifestyle by: 1) feeding my body healthy, real foods most of the time, 2) creating dishes at home that are both nutritious AND delicious, and 3) enjoying my favorite unhealthy foods occasionally and in moderation. 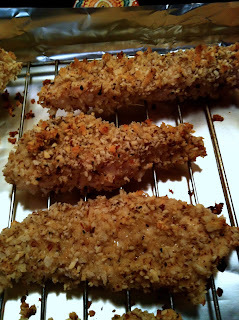 The dinner I made tonight satisfies #1 and #2 - I can't even believe how delicious these healthy chicken tenders are. They're crispy on the outside, tender on the inside, and super flavorful. 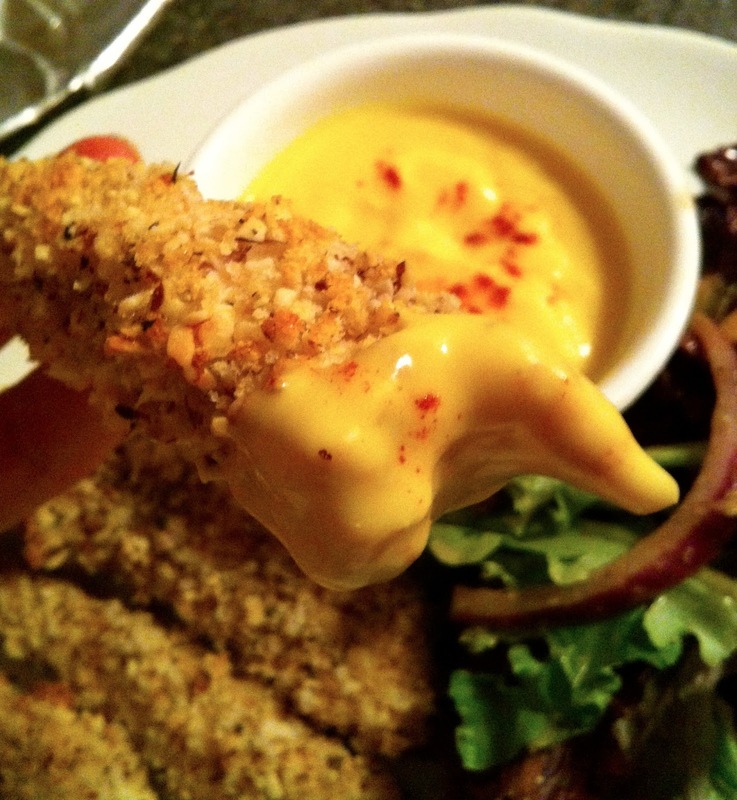 Totally reminiscent of the fried chicken fingers I not-so-secretly love. But best of all, they're coated in heart-healthy crushed almonds and a bit of panko then baked - no flour, no oil. Dip them in a lighter version of honey mustard dipping sauce (with much of the mayo substituted with greek yogurt), and you have a dinner that satisfies a craving for chicken fingers without making you feel like crap. Win! 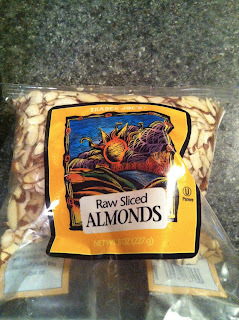 Put them in a food processor and grind until they're fine. If you don't have a food processor, you can put them in a bag then bang them with a heavy-bottomed skillet or a mallet until they're crushed. Combine the ground almonds with 1/3 cup panko bread crumbs, garlic powder, dried basil, salt, and pepper. 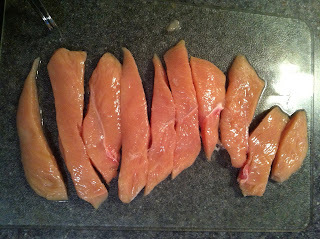 You need to either cut thin chicken breasts into strips, or you can buy chicken tenderloin strips from the grocery store. I cut 3 thin breasts into about 10 thin tenders. Season with salt and pepper. And prepare your baking surface. You want to put a cooling rack on top of a baking sheet covered in tin foil. Cooking the chicken on a rack allows it to get crispy on all sides. 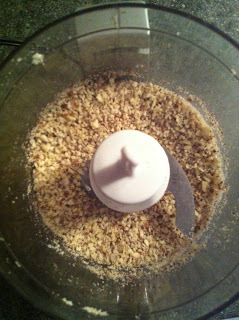 Dip each chicken tender into the egg mixture, then lay in the almond mixture, coating the entire surface well. 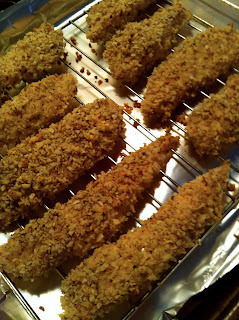 Lay onto the baking rack, not letting any of the tenders overlap. 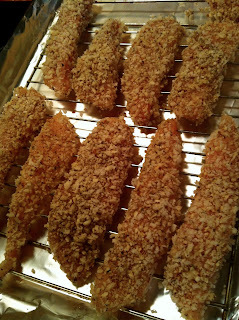 If possible, refrigerate the coated tenders for 30-60 minutes before cooking. This makes the coating stick better and they get crispier. When ready, pop them in a preheated 400 degree oven. While they're cooking, make your honey mustard. 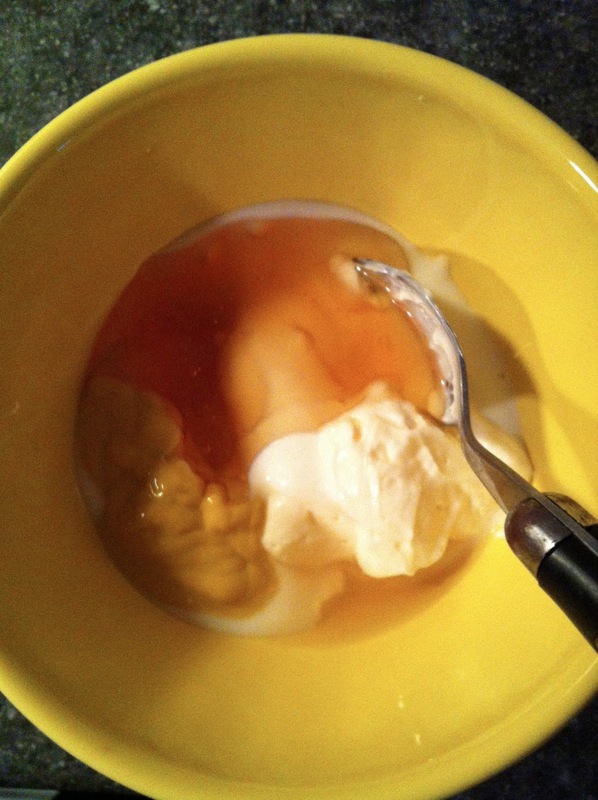 Combine 2 tablespoons of greek yogurt, 2 tablespoons of light mayo, 2 tablespoons of yellow mustard, 1 tsp of apple cider vinegar, and 2 tablespoons of honey. Mix very well. Scoop into a serving bowl and top with a pinch of paprika. Refrigerate until you're ready to serve. After about 20 minutes, the tenders will be mostly cooked but they still need to be browned a bit more. So, turn the oven broiler on to high. Broil for about 2-3 minutes on the first side, then flip the tenders and broil for another 2-3 minutes. 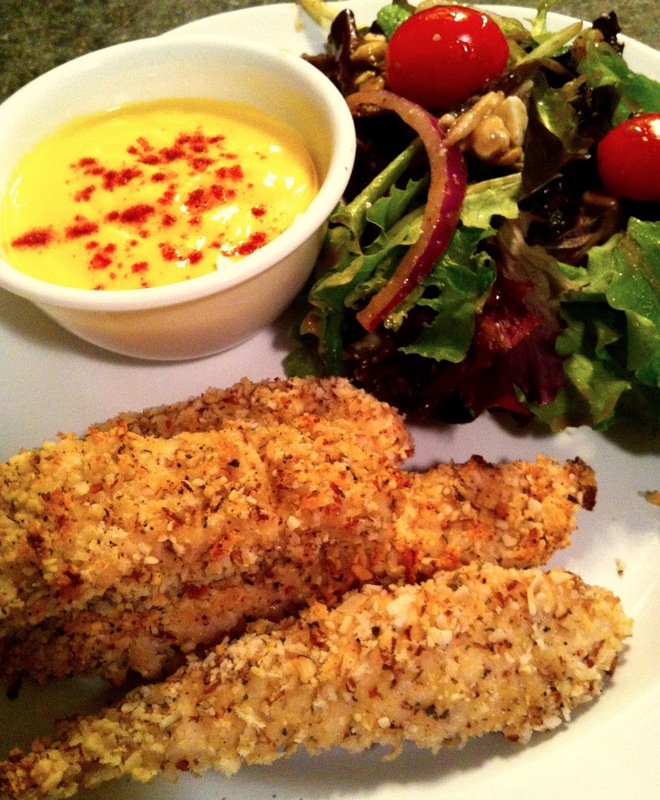 Serve these chicken tenders alongside the honey mustard dipping sauce with a side of mixed greens salad or other veggie. Yum! -Prepare dredging station: in one shallow bowl, whisk egg with milk. 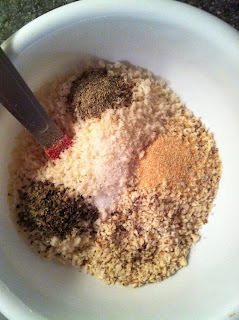 In another bowl, combine ground almonds, panko, garlic powder, basil, salt and pepper. 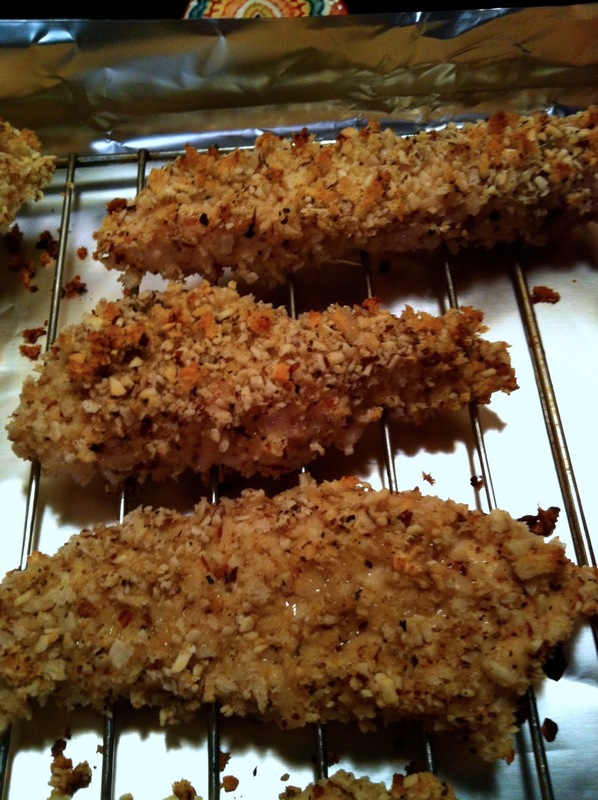 Lay chicken strips on flat surface and season with extra salt and pepper if desired. 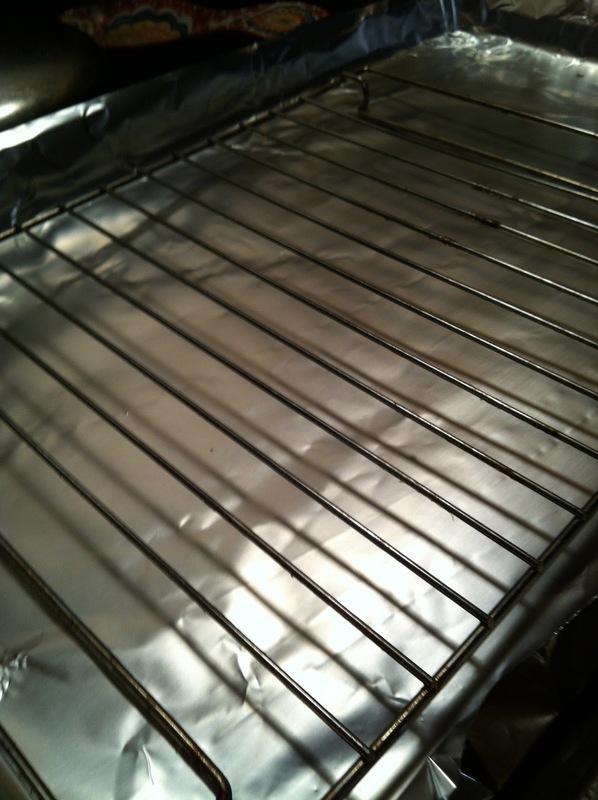 -Prepare cooking surface: lay a cooling rack on top of a baking sheet that's covered with tin foil. 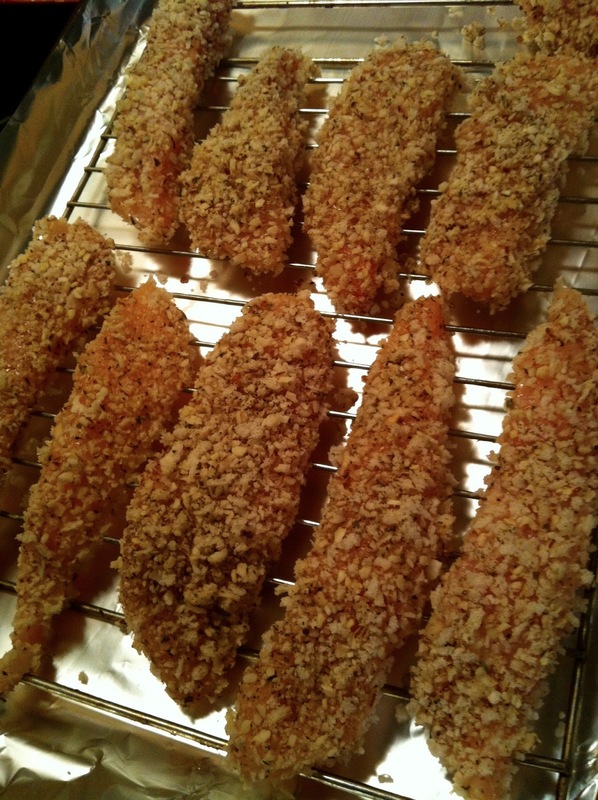 -Dip each chicken tender into the egg mixture then the almond mixture, coating well. Lay on rack on top of baking sheet, making sure none of the tenders are overlapping. -If possible, refrigerate tenders for 30-60 minutes before cooking. -Put in oven and cook for 20 minutes. 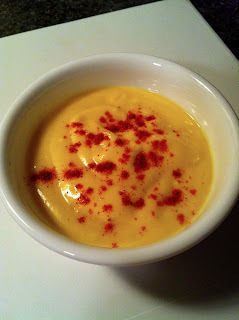 -Meanwhile, prepare honey mustard: whisk together mayo, yogurt, mustard, honey, and vinegar. Mix very well. Top with a pinch of paprika. Refrigerate until ready to serve. -After 20 minutes of cooking, turn the broiler on high. Broil chicken for 2-3 minutes on first side, remove, flip tenders, and broil for another 2-3 minutes. mmmmmmm nom nom nom. My kiddos would LOVE this! 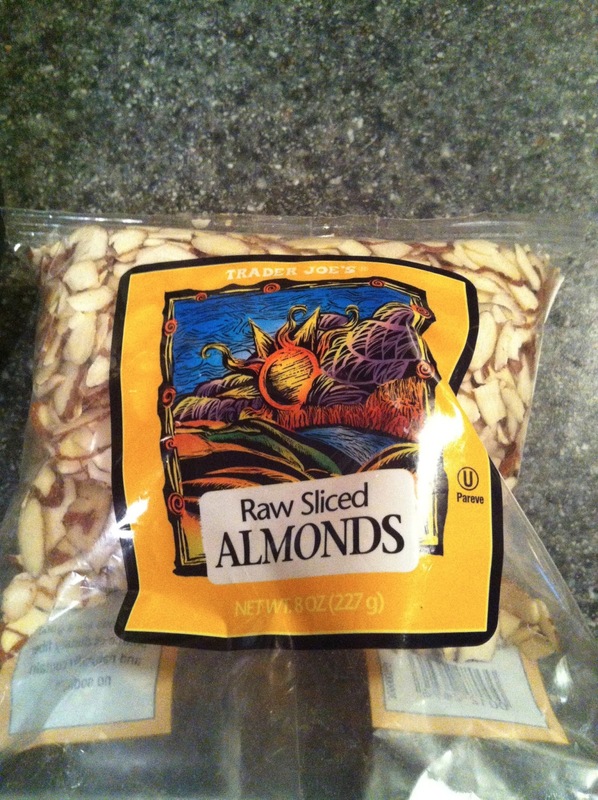 Any suggestions for an almond alternative, though? Jameson cannot have any tree nuts or peanuts! Hmm, your version of heaven sounds a LOT like mine :) These look incredible! I just saw these on Pinterest, and can't wait to make them! These sound great! Thanks for sharing.